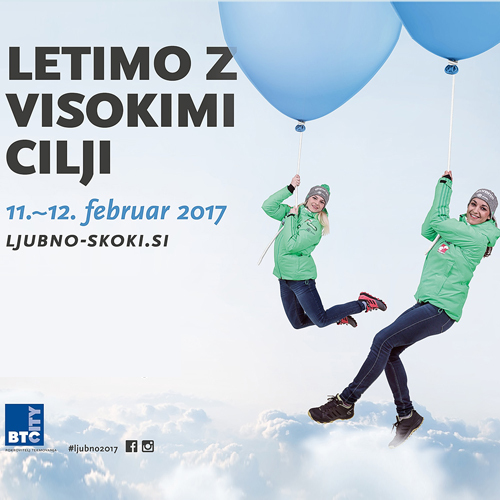 Ljubno 2017: Fulfilled wishes and even higher goals • BTC d.d. Last year, I was more than thrilled and happy to watch our Slovenian girls jump in Ljubno, where they fulfilled our not so quiet wishes. All the girls successfully passed the qualification round, and then achieved three historic podium placements on the renovated ski jump. Including the first Slovenian victory in Ljubno! I was overcome with emotions. My hometown of Ljubno grew even closer to my heart and got bigger not just in my eyes but also in the eyes of women’s ski jumping fans. jumping win and attracted record-breaking numbers of visitors and fans. Last year, the people of Ljubno and our ski jumpers outdid themselves with the renovated ski jump and historic results. prepared to reach even higher and fly farther. In addition, the people of Ljubno, without whom the fairy tale of Ljubno would be very different, keep seeking improvements. ski jumping and towards Ljubno. I am certain that our ski jumpers will surpass the set goals also in this season, so no one should miss the World Cup event in Ljubno! I invite you to join us in toasting our high goals!